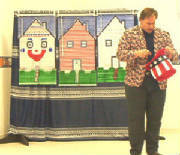 This program is one of our imagination theater programs where we tell an interactive story. Sameville is a place where nobody dares to be different from one another, until a little boy named Charlie moves into the neighborhood. Three very grumpy,unhappy neighbors learn life changing lessons from this little boy. The children's faces light up as these grumpy neighbors slowly start to change. these transformations take place right before their eyes. the learn that they need to be themselves. The goal of this story is to teach kids about peer pressure and how to deal with it.